Constituted by a containing frame that encloses the assembled plates pack with the aid of special tie rods. 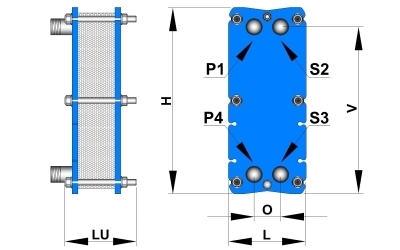 The special fishbone design impressed on the single plates creates between them, when assembled, two perfectly isolated channels, one for hot and one for cold, inside which the two fluids are distributed uniformly and flow in opposite directions to each other. The corrugated surface of the plate causes high turbulence in the fluids flowing inside them and improves heat exchange. The plates are fitted with rubber gaskets that ensure perfect hydraulic seal of the exchanger unit, even in the presence of high pressures.